For a combination of individual engines, to transition from one engine to another means that one has to be shut down and another started while maintaining flight speed. If the engine is airbreathing, then the flow path has to be changed also. In the past, switching the flow path from one engine to another has always been this system downfall. 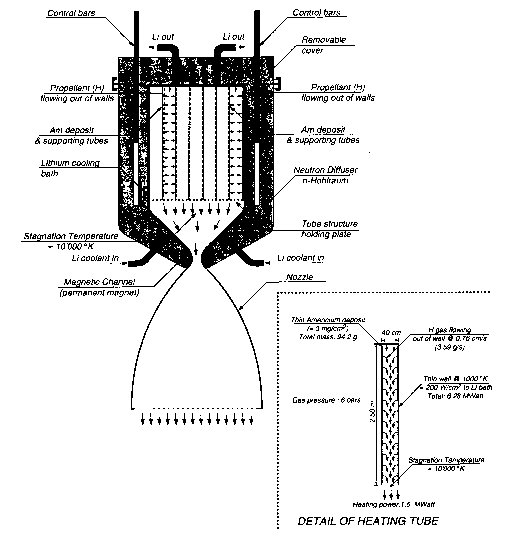 For a rocket engine operating in conjunction with another engine system, the operation is relatively straightforward. The key challenge is to control the fuel path to the engines. For the single combined cycle concept, the engineering challenge is transitioning from one cycle to the next within a single engine. The transition from one engine cycle operation to another must be made efficient (on First Law basis that means the total energy losses must be minimized) and effective (on Second Law basis that means when the available energy is available for recovery as useful work, the energy conversion must be accomplished then or become unrecoverable). An engine of category (c) is designed for the minimum entropy rise across the cycle. The scope and limitations of these engines are discussed in detail in references [Escher, 1994; Czysz, 1993a,b], and there are several advantages to such a scheme that have been identified. In the case of most airbreathing propulsion systems the transition from one cycle to another is not a showstopper. For airbreathing propulsion the two most important considerations are: the flow energy compared to the energy the fuel can add to the flow through combustion, and the internal flow energy losses due to internal drag of struts, injectors and skin friction and fuel/air mixing.